What is “unboxing” and why do we love watching people unwrap parcels? Unboxing videos capture the excitement of unpacking a parcel. People watch the reveal as the recipient gives a running commentary whilst opening the box and showing what’s inside. 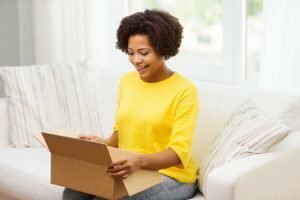 Commenting on the parcel itself, the packaging and any flyers included in the delivery before finally showing off and, in some cases testing, the actual product. Unboxing was first noticed by Google as a trend in 2006, with many of the first videos featuring mobile phones. There are now over 60 million video results for “unboxing” on YouTube, all aiming to share that Christmas-morning feeling of receiving and opening a parcel. The idea of unboxing is to show the product exactly as it arrives. Sometimes this goes further and turns into more of a review, showing how easy (or otherwise) it is to get up and running, whether that means applying makeup from your beauty order, or setting up a new tech gadget. Some unboxers have purchased the products they are opening. Others are unwrapping packages sent by sponsors. Often the more popular videos are those that are easier to relate to. We’re just as interested in watching someone like us open up an order from EBay or Etsy, as watching a supermodel unwrap her shopping haul. Here is one from a vlogger who ordered from our client, Lush. As more and more unboxing videos are posted, vloggers compete to produce even more elaborate footage. Take a look at this unboxing of the Galaxy S7 a waterproof mobile phone, filmed underwater. Whilst unboxing an Apple product shows off its elegant, designer packaging, when the parcel as a whole has not been considered, unboxing videos can take away from the glamour of the product. For example, this vlogger opening a food parcel expects the snack box to be presented in a shiny “box inside a box”. Disappointingly the snacks are just loose inside the carton. So, the question for online retailers is, how do you make your packaging worthy of an unboxing video? The good news is that if you’re selling beauty, food or tech products, it probably already is. To make sure your product stands out, you will need to think about everything from the label on the packaging inwards. Think of it as “pass the parcel”. If someone was narrating as they opened your delivery, what would they say? Is the postage label professionally printed and neatly attached?Or blurry and hanging off? Is the carton or envelope high quality? How is the product presented inside? Is there a “box within a box”? Is your delivery note “on brand”? Could you include any surprise gifts? Or offers? If you need some help smartening your box up for opening, do get in touch. Give us a call and we’ll talk you through the options for making sure your labels and despatch forms are all doing their bit to add to the unboxing experience. And if you’ve had any great unboxing experiences, or seen any great videos, do share them with us on Twitter.